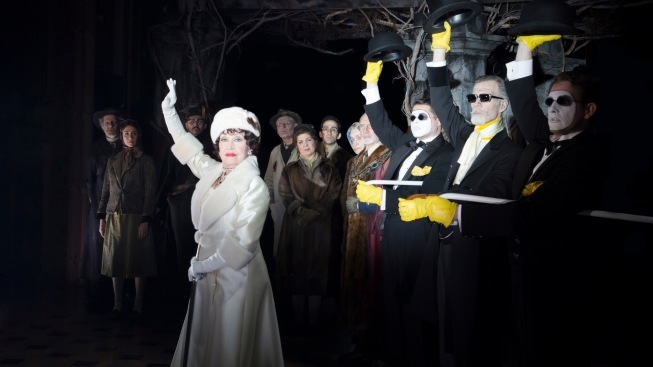 Chita Rivera and the cast of "The Visit." Never trust a woman who travels with her own coffin. That's one big takeaway from “The Visit,” the thought-provoking and—there’s no other word for the experience—bizarre musical starring Chita Rivera as the richest woman in the world. It’s just opened at The Lyceum Theatre. Rivera’s vital performance as Claire Zacahanassian, a woman who has married both well and often, is just one reason “The Visit” is notable, here at the end of a crowded theater season. The two-dozen songs briskly presented in a single 100-minute act represent the final collaboration between John Kander and Fred Ebb, the legendary duo behind “Cabaret.” The story, based on a 1950s German play about greed and vengeance, is by Terrence McNally. And “The Visit” is directed by John Doyle, the noted Sondheim interpreter. The people of Brachen, Switzerland, are destitute but have cause for optimism when the mayor gets a telegram from wealthy Claire, who announces she’s coming home to the village where she was born. Claire arrives with dozens of bags in tow, a creepy butler, and two even creepier eunuchs … in white face makeup, with bowler hats. Also, she’s brought that coffin. Claire can revitalize Brachen’s economy, but there’s a big catch—she’ll only do so in exchange for the life of Anton Schell (the ever-magnificent Roger Rees), who broke her heart as a young girl. “The Visit” focuses on the feelings Claire’s proposition raises among the townspeople, Anton’s family (his wife is played with icy glee by Mary Beth Peil, of “The Good Wife”) and indeed, Anton himself. Rivera is provocative as Claire. The venerable actress is on stage for most of the production, and gets in a few chorus line kicks here and there (I’m not being ageist: Claire is a woman with a false leg and a false arm, lost in separate incidents: “I’m unkillable,” she avers, earning one of the evening’s sparingly doled-out laughs). The two-time Tony winner has an entrance, in billowy white fur coat and hat, that’s as thrilling as you’d want it to be. Moreso, it’s chilling to realize how at peace she is with her request. Rees, as Anton, doesn’t have a death wish, but he’s an older man and he knows an interesting offer when he hears one. Anton doesn’t have much ground to stand on in terms of challenging Claire’s anger—he was a louse (Claire’s butler and odd companions factor in to their terrible history), and he knows there’s a price to pay. He’s just not sure how steep that price should be, and of course, neither is anyone on stage (if only “AFV”-style polling had been available for the audience). Rivera is solid, but it’s the melancholy and soulfulness in Rees’s performance that holds back “The Visit” from any risk of sliding into a parody of itself (the eunuchs are ripe for satire). The operetta-like Kander and Ebb score haunts, notably “Yellow Shoes,” in which the townspeople sing of the material pleasures they’ve been denied. It’s staged so the audience focuses on the new possessions so many of the residents acquire on credit, as they wait for a decision about Anton. As the lights focus on the footwear and everything else fades to darkness, the whole thing comes off as a grisly live-action filtered Instagram photo. I’m still thinking about it, and may burn my Amex. The superb supporting cast includes Jason Danieley (“Next to Normal”) as the town’s schoolmaster, and David Garrison (TV’s “Married with Children”) as the mayor, who will have to justify whatever decisions are made about Claire’s proposal. John Riddle and Michelle Veintimilla (below) are lovely as the young version of the two protagonists; they begin the musical performing a balet in which an overtly sexual act is mimed—it certainly set the tone for the evening. “The Visit” was due on Broadway in 2001 with Angela Lansbury starring. But a confluence of personal events in Lansbury’s life and, later, changing attitudes about entertainment in the wake of 9/11, scuttled plans. It got a new life, with Rivera starring, in 2008 at The Signature Theatre outside Washington, D.C. The one-act production with many members of this cast was performed last year at Williamstown. Do everything in your powers to avoid having the ending spoiled. It will be bliss to sit through “The Visit” asking the question that’s clearly supposed to be on our minds: What would we do if we were one of those people in Brachen? I think we’ve established what they are, and now we’re just trying to put a price on it. “The Visit,” with an open-ended run at The Lyceum Theatre, 149 W. 45th St. Tickets: $29-$149. Call Telecharge, 212-239-6200.